Material analyses were conducted before starting the conservation work. The fibers of the fragments had deteriorated and only fragments of the painting were left. 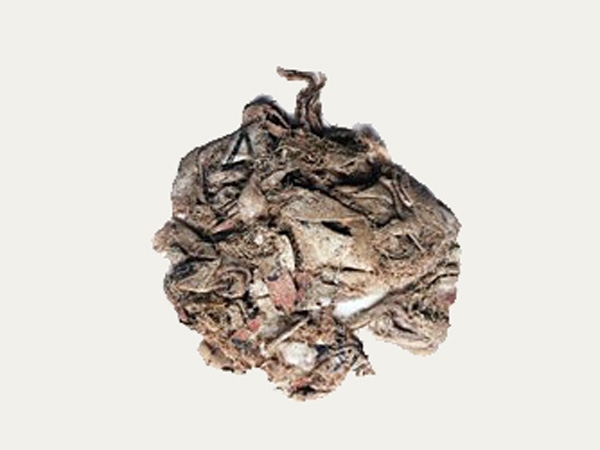 Remains of a fine, woven linen fabric, which had been glued onto the mummy shroud before it was painted, probably to mend it, were found on three fragments. Picture 1: A painted and totally rumpled piece of original linen textile, of approximately 21.5 cm width and 20 cm length, Egyptian Museum and Papyrus Collection, Berlin. The fabric was grounded and painted on one side. The grounding comprised of gypsum and starch glue. Starch, proteins, two different red pigments, a black and a green pigment were identified in the tempera painting. The fabric had to be moistened to make it soft and pliable. The maximum value of 90% relative humidity should be reached slowly and under controlled conditions. Saline solutions of sodium chloride and barium chloride proved suited for raising the humidity. 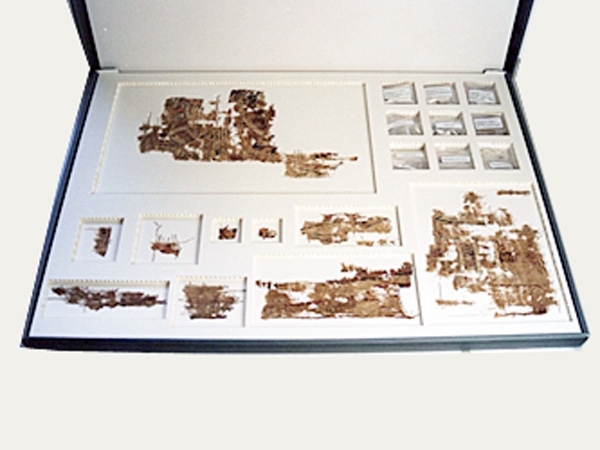 Picture 2: Passepartout preservation folder with integrated fabric fragments of an Egyptian mummy, bedded in in unbuffered cotton board, embedded in the board material of the clamshell box. While trying to find out suitable ways and means for consolidating the paintings one decided to focus on the following points: reversibility, high adhesive power, pliability and age resistance. 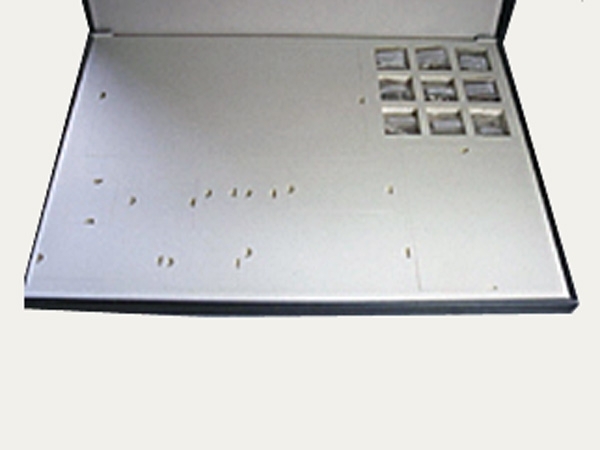 A series of tests showed that HES Kollotex 1250 applied in low concentration did not change the surface character of the mount, powdery paint layers and possessed high adhesive power. Moreover, an ageing test indicated that HES Kollotex 1250 neither yellowed nor became brittle after 900 hours of irradiation (Xenotest 450). The starch ether was colloid dispersed in 2.5% de-ionized water at a temperature of about 90 degrees Celsius, and after cooling compressed air was sprayed two times on to the surface by using an inhalation device. 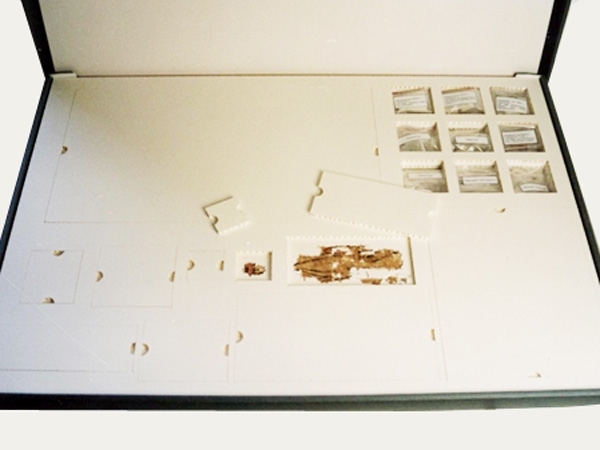 A folding box made of unbuffered cotton and museum board with an integrated mount combination was constructed for stable storage of the fragments. Protection, Preservation, Identification – A painted and rumpled piece of textile from the Egyptian Museum in Berlin, excerpt from Restauro 05/2003, author Isabella Waltriny, Cologne.